The youth wrestling season (PreK-6th grade) will be starting soon and we’d like you to join us! We hope to relay this information to as many ZM parents and youth as we can. Please help us out by sharing this post! New to wrestling or looking to try it again? We are offering a free practice on Monday, November 6th at 6:00 PM in the Mazeppa school wrestling room led by high school coach Link Steffen. This practice provides the opportunity to learn more about the sport without any commitment. See this flyer for more details. Registration is Monday, November 6th at 7:00 PM in Mazeppa school large gym. We’ll cover practice schedule, important dates, opportunity to order singlets, and other essential information. You can get a head start and download the registration form and bring it with you on the 6th. 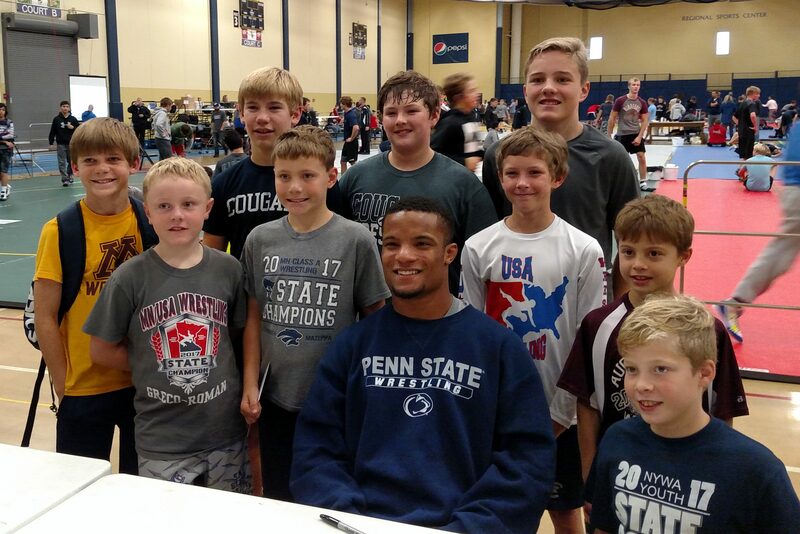 9 Cougar wrestlers had the privilege to spend an hour with 2 of the best MN wrestlers of all-time, Mark Hall and Brady Berge. Mark and Brady hosted a clinic prior to the InterMat JJ Classic in Rochester on Saturday, October 21. At the clinic were Kaleb Lochner, Owen Lexvold, Gabe Tupper, Cain Lexvold, Luke Krier, Mark Hall (sitting), Jack Krier, Ryan Lexvold, Sam Moore, and Isaac Moore. Competing in the JJ Classic were Michael Majerus and Ethan Kovars. Next Next post: The 2017-2018 Season is upon us!